The formula is given, and it's worked before: Plot lines from Seinfeld with Kramer the visionary, George who just can't pull it together, Jerry and Elaine whining about everything, and Newman plotting something evil in his apartment, all squeezed into short tweets with something extra added. This time it's eSports. 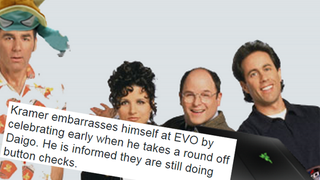 Esports Seinfeld's twitter is full of tweets like the ones below and they're just as silly as you'd imagine: Seinfeld characters making a visit to the world of competitive CS:GO, StarCraft, Smash Bros., LoL and Dota.